Spring is coming. I can feel it. At any moment, it will be time for parties on the back porch (or front porch, if you're bold and don't care what the neighbors think) and the refreshing cocktails will be flying. I've got the perfect cocktail for YOU. The Tom Collins is a Collins cocktail made from gin, lemon juice, sugar, and carbonated water or soda. Essentially this is a gin and sparkling lemonade drink is typically served in a Collins glass over ice. I don't know who Tom is, but I like his drink. I'd never had one before a few months ago. I'm slacking on my drink game. A Collins glass is typically a tall cylindrical glass used to serve mixed drinks. Well, I mostly have pint glasses from my various exploits around America and I don't have a proper Collins glass. Or so I thought. 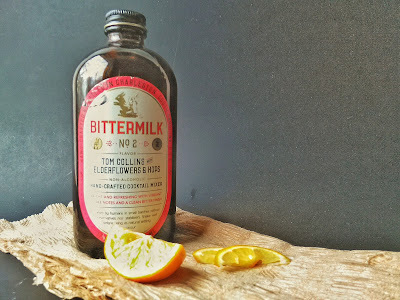 Bittermilk's non-alcoholic mix cuts out most of the middle man and all you have to do is add vodka, gin and soda to make your own Tom Collins at home. 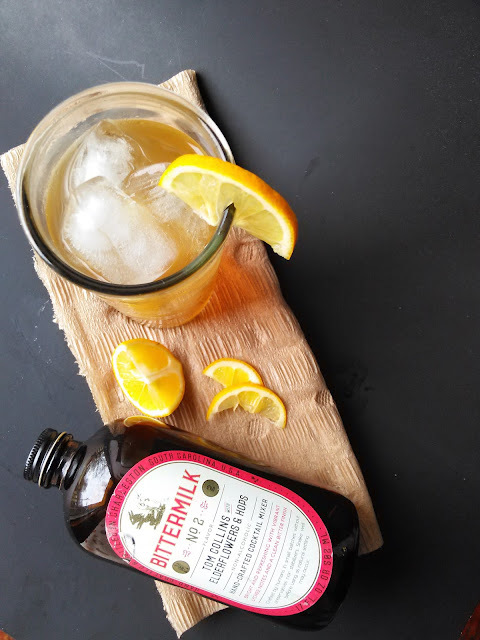 Bittermilk is handcrafted in Charleston, South Carolina and is taking the drink world by storm. Featured in publications like Food + Wine Magazine, Real Simple, The Wall Street Journal and Imbibe Magazine, the handcrafted cocktail gets upgraded by the company's mix of ingenuity and ingredients. Compound No. 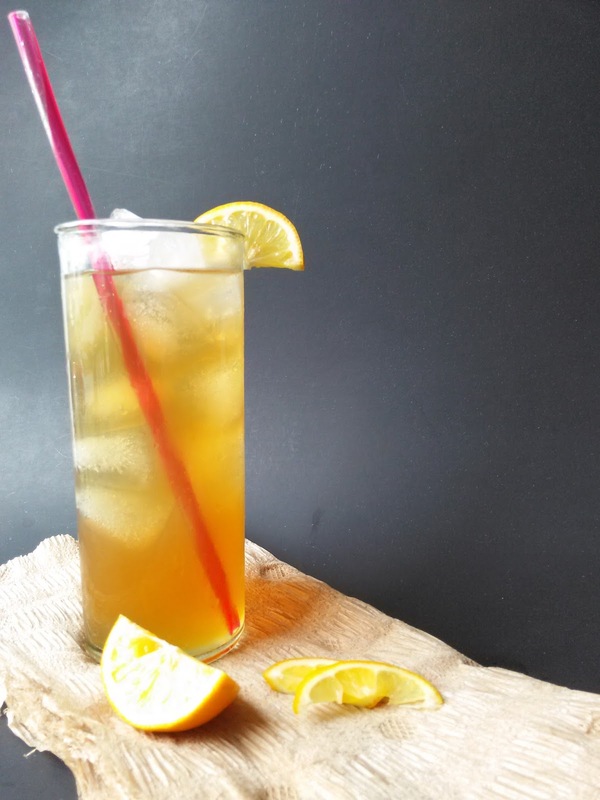 2 or Tom Collins with Elderflowers and Hops is intensely citrus and then the Centennial hop mellows out that citrus profile by adding another dimension of flavor. Who knew gin, lemon juice and water could get so fancy? Not a Tom Collins fan? That's okay! Bittermilk has 5 other signature cocktail mixers that are perfect for you: Smoked Honey And Whiskey Sour? How about an Old Fashioned? The sky's the limit, guys. The sky's the limit. Build in a tall glass with ice. Stir with straw. Garnish with a slice of lemon. Interesting that Bittermilk is simplifying the already simple Tom Collins, yet somehow making it more complex! I'd try it. For the record, my husband believes he wooed me with a Tom Collins. I think it was a Harvey Wallbanger. That sounds delicious. 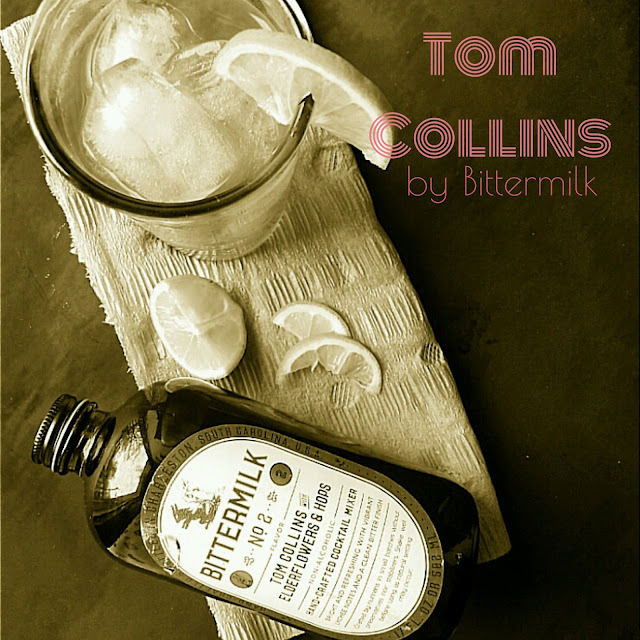 Tom Collins has always been one of my favorite drinks. I can't wait to try this twist.